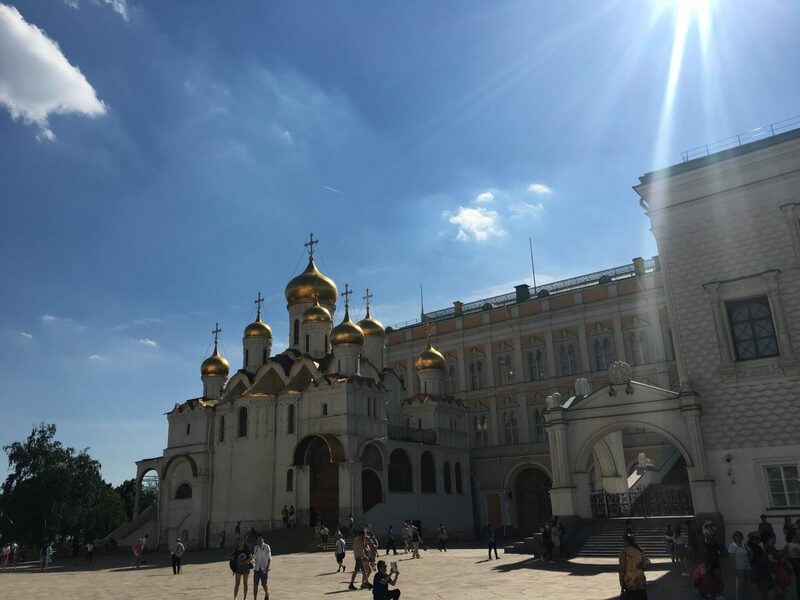 As part of SRAS’s Russian as a Second Language (RSL) program at Moscow State University, I had the opportunity to attend a guided walking tour of the Kremlin and its museums. We had a professional tour guide provided by SRAS who was very well informed about all aspects of the Kremlin’s sites and always willing to answer questions. The tour, as offered by SRAS each session, can differ slightly based on availability and timing. 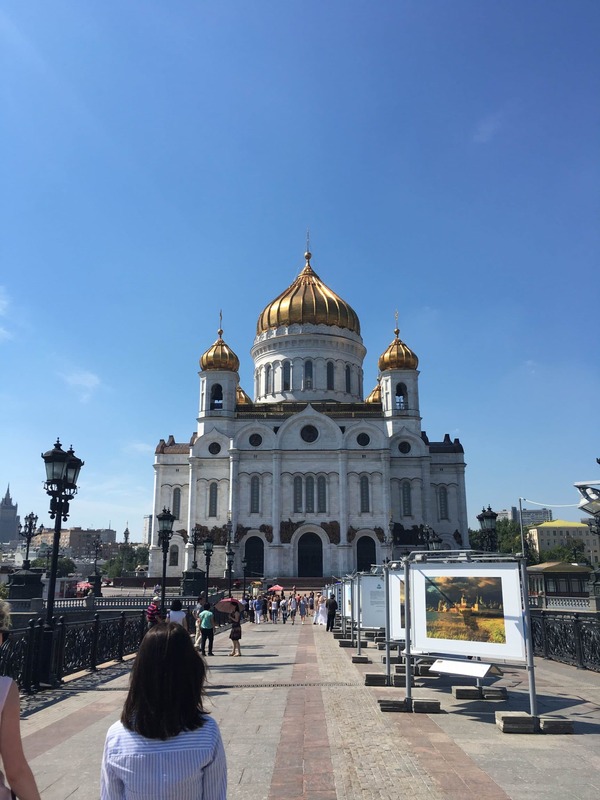 We began our day’s tour not at the Kremlin, but at the nearby Cathedral of Christ the Savior, Russia’s largest Orthodox cathedral and one of the largest Christian structures in the world. Note that there are wardrobe requirements for entering the church (men and women both must have their shoulders covered, while men cannot wear shorts and women must wear skirts at least beneath the knee). Before going inside, we were taken around the massive structure, and given a brief yet informative overview of its history. We learned that, despite the classical style of the building, it is actually only about 20 years old, having been constructed to resemble the church that once stood on the same ground. During Communist times, the ground on which the Church now stands was a massive swimming pool, having been filled with water after the original Church was destroyed. The plans that the Communists originally had for the site were to construct the headquarters of the Communist Party of the Soviet Union, which would be one of the tallest structures in the world and house the office of the Soviet Union’s premier inside the head of a giant Vladimir Lenin statue adorning the top. The Cathedral is a truly stunning structure. Comparable only to St. Peter’s Basilica in Rome in my mind, the sheer amount of open air is amazing when one considers how still and tranquil it is on the inside. We then continued onwards to the Kremlin itself, which was teeming with guided tours from all over the world, just like ours. Seeing other groups from America, but also some from France, Italy, China, and several other European and Asian countries was very interesting, as people tend not to think of Russia as a popular tourist destination. However, tourism here has grown rapidly in recent years, particularly since the ruble lost about half its value on world markets, making Russia a much more affordable location. Anna informed us of the purposes of all of the first structures we encountered within the Kremlin walls. First of all, though, she made sure that we were aware that the word “Kremlin” does not refer just the center of government in Moscow, but is a general word that means fortress. Most Russian cities and towns of reasonable size and with a medieval history possess a Kremlin. We saw one of the offices in which President Putin occasionally works, as well as the large, semi-controversial event and concert hall that resides just inside the main entrance to the Kremlin. 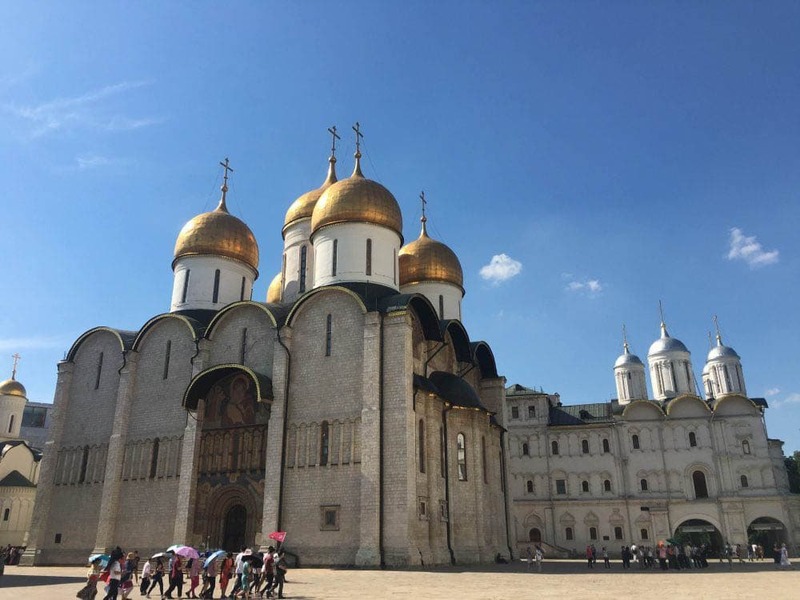 Despite its modern style that clashes somewhat with the comparatively ancient structures around it, the fact that the building is covered in glass at least ensures that it reflects the beauty and history that abounds within the Kremlin. 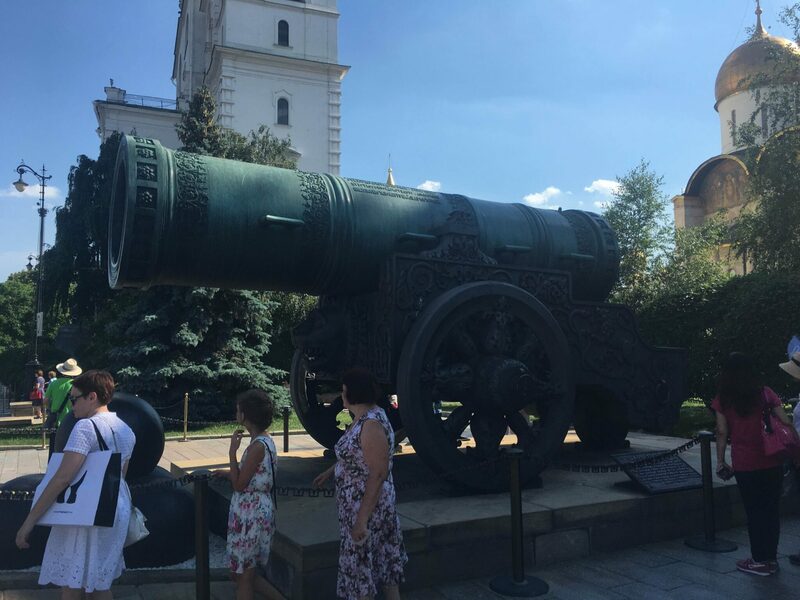 After seeing the aptly named Tsar Cannon and Tsar Bell, both of which are two of the largest objects of their kind in the world, and neither of which have been used for their structural purpose in their existence, we moved on to see several of the many churches that stand within the walls of the Kremlin. Inside the Church of the Annunciation, we were informed of some of the basic components of any Russian Orthodox Church. For starters, every inch of wall is covered in some image or another, from icons of Saints to giant murals that depict judgment day and the people of earth being sent either to heaven or hell. We also learned that the altar in an Orthodox church is given its own room, to which only the priests are allowed entry. The mysticism that is native to Orthodoxy and inherent to its liturgy was embodied in all aspects of these churches. After our tour of the Kremlin’s outside squares, we were taken on a tour of the Armory Museum, which houses outfits, household items, carriages, armor, weapons, and various sundry items that belonged to the Tsars and Tsarinas of Russia. Anna knowledgeably led us through the various styles worn by different Russian rulers, and explained the significance(s) behind the appearance of what they wore and the carriages in which they rode. We were in awe of the beautiful jewels that encrusted everything the royals wore and every vessel out of which they drank or off of which they ate, not to mention of the thrones on which they sat. We saw gifts from foreign dignitaries and rulers, and even the museum’s collection of Faberge creations. All in all, it was a day rich with history and made even more enjoyable by our friendly and incredibly knowledgeable tour guide, Anna. There is hardly a more essential Russian experience to have during your time in Moscow than a guided tour of the Kremlin. Incidentally, Anna, a guide that SRAS has worked with for years, helps run a guiding collective in Moscow called Bridge to Moscow. They run many private tours and are available for custom tours and travel as well.